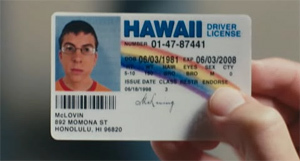 What stands out are the performances by EVERYONE - all memorable characters (especially McLovin! ), played by virtual no-namers (you mighta heard of Michael Cera and Seth Rogen), who perfectly capture the essence and angst of high school. The cops were a little over-the-top, but funny nonetheless. There are scenes which reminded me dead-on of the ol' Vice Nights....yeeesh! Very funny stuff here from start to finnish. Mitch & I were PLOTZing in our seats. Again, too much to mention, and I don't want to spoil anything but a very funny movie. I see becoming an "instant classic" especially with a younger crowd. I loved the movie, watched it with the missus...she didn't laugh as MUCH, but still enjoyed it. I find all these Seth Rogan/Judd Apatow thingies to be more "male"centric, dealing with the angst/problems of being a man. So girls might have a harder time relating (hell, they can go watch Sisterhood of Travelling Pants). I do, however, find they perfectly capture the life of "REAL" high school (heavy use of quotes), from the language to the way people REALLY act.